A new, organic technique produces non-toxic, biodegradable paints that shine as brilliantly as peacock feathers and butterfly wings. Now here's a bright idea. 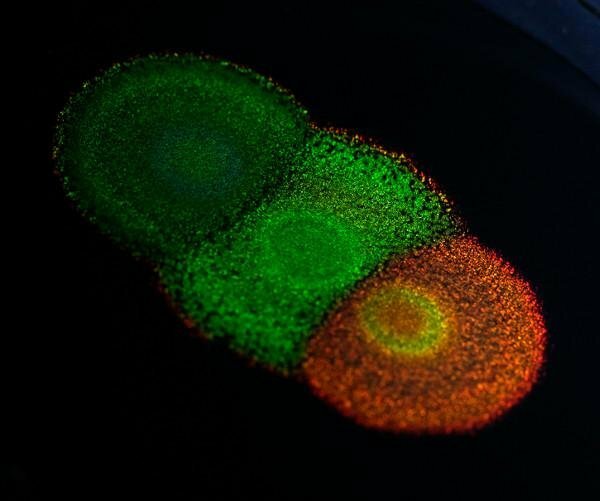 Researchers in Europe have developed a technique for growing genetically modified bacteria that can be used as brightly colored “living paints” in manufacturing and art. The colors generated by the bacteria, shiny and metallic, are actually generated by the same optical process that makes peacock feathers and butterfly wings so visually striking. The color comes not from organic pigments, but rather the very molecular structure of the bacterial colony. In a collaboration between the University of Cambridge and the Dutch company Hoekmine BV, researchers developed the unique process by genetically modifying colonies of flavobacteria, a kind of bacteria that produces colors as a byproduct of its own internal structure. Depending on how the genetics are manipulated, the bacteria reflect light at different wavelengths, potentially including all colors of the visual spectrum. The new research could provide manufacturers with biodegradable, non-toxic paints that are grown instead of synthesized. The new technique is a result of collaboration among researchers in several scientific disciplines, said co-lead author Silvia Vignolini, professor in Cambridge's department of chemistry. To develop the new process, researchers compared the genetic information, optical properties, and anatomy of multiple natural and mutated bacterial colonies. By mixing and matching elements of different colonies, researchers found they could generate different optical effects. For instance, researchers changed the genetics of one particular colony to alter the way individual bacteria move around. That change altered the geometries within the colony, which in turn changed the color from green to blue, then eventually to red. The research team was also able to create brighter or duller coloration, or even make the color disappear entirely. “We mapped several genes with previously unknown functions and we correlated them to the colonies' self-organizational capacity and their coloration,” senior author Colin Ingham, CEO of Hoekmine BV, said in a statement released with the new research. As to practical applications of the technology, any large-scale deployment is still several years away. But Vignolini said the time may come when such “living paints” are available in car dealership showrooms and on hardware shop shelves. “The future is open for biodegradable paints on our cars and walls, simply by growing exactly the color and appearance we want,” she said. Interestingly, one of the first consumer products might be aimed at kids, Ingham said. The living paints might have other useful applications, too. Because the living bacteria can react to other molecules, they could be used to make materials and surfaces that change color under designated circumstances. Considering the paints and coatings are quite literally alive, one question remains. This may be indelicate — to the bacteria, anyway — but what happens when the bacterial colonies die? Shine on, brave bacteria. You shall not be forgotten.